A specter is haunting politics, the specter of modern art. If that isn’t the most contrived sentence I’ve ever written, I will rapidly eat the Reichstag, ministers and all. But it’s true nonetheless. In the last several years, modern art has become interwoven with political culture in significant ways. The case of the Trump family, and their opposite number, the Podestas, illustrate the creative conundrum perfectly. Art has always been political, because art is part of the culture. Culture is based on shared values, and those are the result of group decisions. Group decision-making is the definition of politics. Additionally, because patrons are important for artists, art has always commented on wealth or influence. Whether praising it, or critiquing it, art is inherently concerned with power. At its best, this includes patrons like the Medicis of Florence backing the works of the Renaissance giants. In our own era, this usually takes the form of the public funding creative work through direct purchase. When we buy a ticket to a Scorsese movie, we don’t think of ourselves as playing the role of a Rockefeller funding a filmmaker, but in effect, that’s what we’re doing. Bernini had Pope Urban VIII as his patron; The Pixies had the American consumer. What happens on the private level also happens on the public level too. The NEA backed Arthur Miller and the CIA supported Abstract Expressionist art in the Fifties and Sixties. Dreary Mao encouraged social realism, featuring smiling peasants who were definitely not starving to death in the countryside. Every kind of regime, from the profoundly zany to the super-bougie, have funded women and men in turtlenecks since the dawn of time. Strictly speaking, there is no regime which is anti-art. They may not like all art equally; they may encourage songs and hate pictures; they may support art which is thoughtless, propagandistic, derivative, or cringeworthy, but they still lend it their blessing. Because the force of numbers is always on the side of the public, governments rule through opinion. Therefore, crafting and shaping opinion is of the greatest importance to presidents and princes, and one way that’s done is through creative work. However, in recent years, a strange interaction between art and politics has sprung up. They echo and reflect each other in very strange ways, ways which are not understood by the general public. Nowhere is power and influence so concentrated as in New York City, and, unsurprisingly, the world of art resides there as well. It would be interesting to draw a map of the creative ley lines running between Manhattan, home of private art grants, and Washington, D.C., home of government art grants. Indeed, it is within these two cities that our story lies. Anyone surprised at the Trump family’s ties to the art world does not know New York very well. Being influential in that famous city means bringing your life into the orbit of creatives. It would be more unusual not to be part of the scene; it would be like living in Miami and never interfacing with the beach, or dwelling in the depths of Silicon Valley without reading Malcolm Gladwell. Consider Ivanka Trump’s Instagram feed (approximately two million followers). It’s filled with images of her apartment. Meaning lots of pictures of her art collection. She’s a known patron of the city’s creative set. Where does this leave artists? 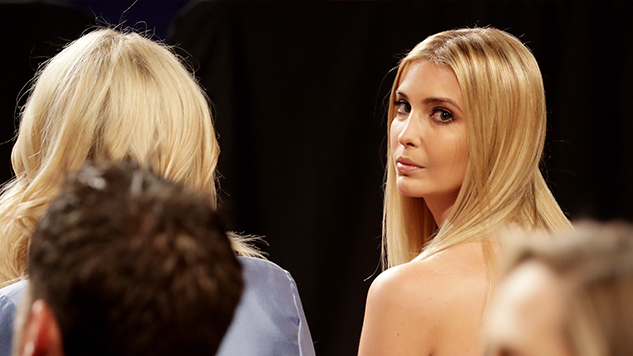 Hoping that Ivanka Trump can lend a sympathetic ear. All of this is understandable, even predictable: the necessary, healthy backlash by a progressive cultural bloc against the likelihood of a reactionary Presidency. There have been many such protests. To be a creative person of any kind—whether you’re a writer, or an artist, or an artist, or a musician, or a sculptor—you have to live a split life. To persevere in the long upwards climb of creative life requires a state of jolly contempt for the real risks involved in being an artist. To paraphrase Louis C.K. : Who does that? Who decides to become a comedian for a living? If artists were rational, calculation-weighing people, they would never have taken the plunge. Creativity requires selective denial. At the same time, nobody can succeed without keeping a keen eye on the audience; you genuinely have to know what people will like. Being creative means caring, and simultaneously not caring, what people think. It means having excellent judgment, and being able to voluntarily turn it off. Of course the people protesting outside of Ivanka’s apartment have a complicated relationship with her, and of course the cast of Hamilton are being polite and provocative at the same time. Art-ing means living double. What makes this fable about modern art truly unusual is that there is a Democratic equivalent to the Ivanka story. It involves the Podestas, a now-famous family of consultants who have been professionally wedded to the Clintons since the Nineties. The Podestas, as it turns out, are devotees of modern art. Performance art, in particular.